The Tiger Tough™ Tidy Paws Litter & Food Mat traps debris and litter from your pet's paws to keep your home neat and tidy. Protect your floors from food and bathroom messes with our line of fun and engaging mats! The gripper mat captures small debris such as litter and kibble while the textured design helps to clean your pet's paws. Our Tidy Paws Mats are water-resistant to keep leaks and spills contained. The Tidy Paws Mat is easy to clean. Simply shake the mat outside, vacuum using an attachment, and rinse in soapy water with mild detergent when necessary. With three unique designs each featuring two unique colors, you can find the perfect match for your home! Dimensions 24.0 In. X 35.0 In. X 1.0 In. 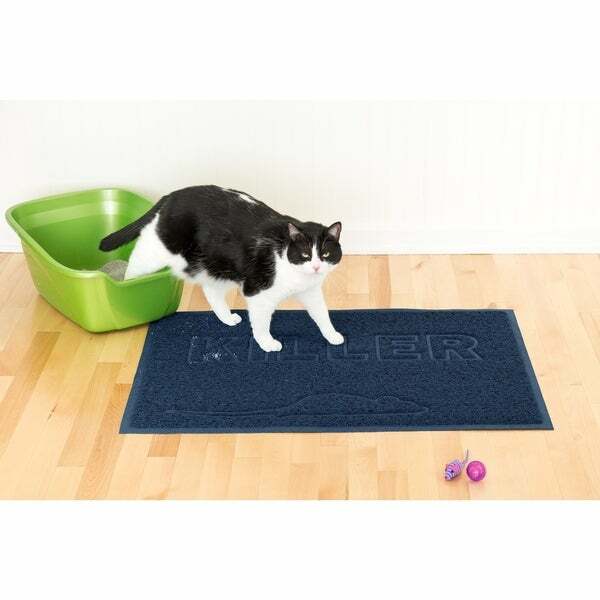 This mat is perfect to put the litter box on. It catches almost all of the litter that gets out. It is easy to shake the litter off it or to vacuum. My biggest laugh was that it says “killer” in embossed letters on it and we got it for our 3# kitten. It seems sturdy and should last a long time. This mat is perfect for our cats. Nice durable rug that is a good size and very easy to keep clean. Just shake it out and hose it off. Provides good coverage so litter is caught before getting all over the floor. The cats love it for cleaning their paws. Highly recommend. it is totally amazing how much litter these mats hold! I shake and shake and more keeps coming out. So worth the money! They clean up easy too! Just take it outside and hose it down. Collects the litter and keeps the area tidy! I don’t know how I’ve lived without this! I take it outside every Dea days and shake it out and it works just like it was advertised! I bought new mats for all my boxes in hot pink and they are adorable! If you have to keep litter boxes in your house like I do with six cats then at least they should be good looking! These are cute and functional and really keep the litter from coming out into my hallways or on my carpets! There a great price and a really good size so I think they're perfect! Great mat! Keeps cat litter from taking over the room and has a somewhat sticky feel. I placed this directly under the litter box and it's made a huge difference. Large size allows for a big litter box. I bought one for me then my daughter. The mat leaves the liter at the box not all over your house! My daughter noticed the difference so she wanted one. She just loves hers as much as I do. Less work cleaning up the litter bc its right by the box. A MUST buy if you have cats!! This is just purr-fect to keep the hallway neater after the cat uses the litter box. Nice color and nice material too. A cute look to a necessary item. The cats seem to like them and will lay on them outside the litter pan house. larger than i thought, which is GREAT !! The color I purchased is pretty and seems to work well -- I have messy kitties, that despite their boxes being covered and automatic, they still track littler out of the box but this keeps them from tracking it further than the box.